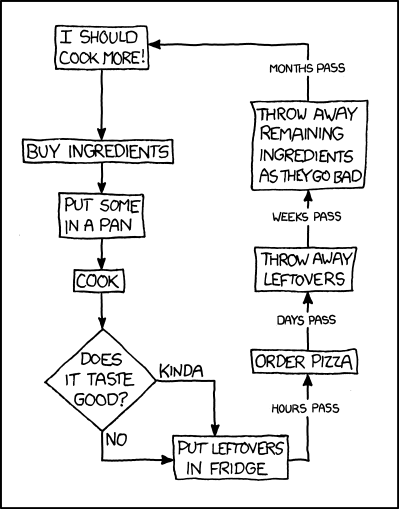 That's pretty much exactly how it was with me and cooking out of college. Months between making anything and lots of pizza boxes and/or burrito wrappers in between. This dynamic is one of the reasons I have always preferred cooking "projects", as opposed to the more minimalist/Ratio approach of Bittman or Ruhlman. For me anyway, cooking has to be somewhat challenging and require a large time commitment for me to get fired up enough to do it regularly... I don't know why, but whipping up a decent stir fry in 30 minutes or less just doesn't excite me. Something to think about if you find yourself falling into the same pattern shown above.